Here is a taste of the delicious recipes you will receive in the From Scratch Cooking: 2018 Edition cookbook. 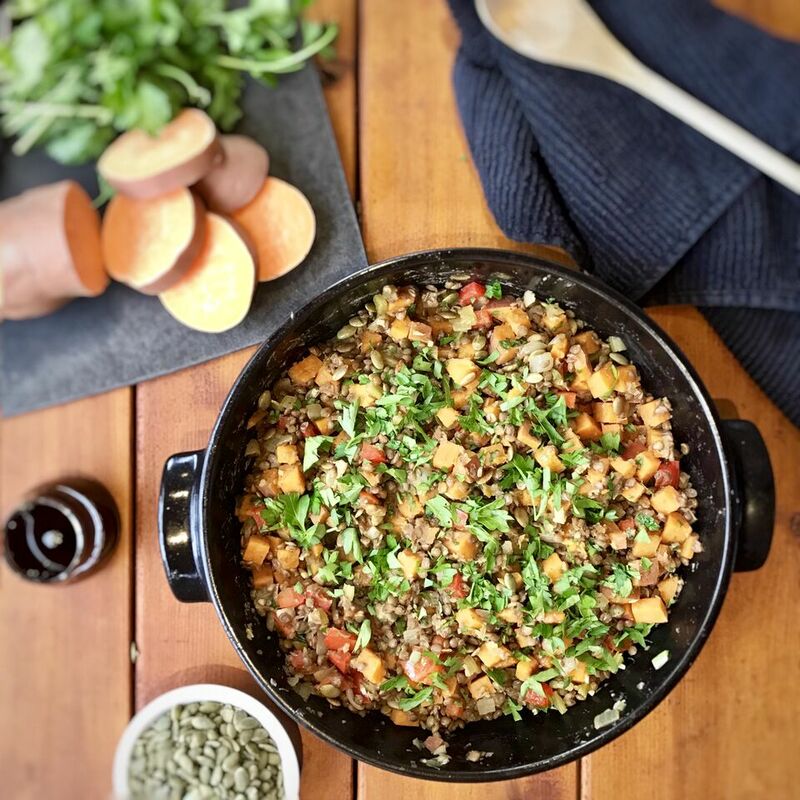 Check out this amazing Sweet Potato & Lentil Goulash recipe my colleague, Candra Reynolds created. This satisfying vegan dish is packed with nutrients, but let’s focus on one of the stars of the show: sweet potatoes. They are packed with Vitamin A (in the form of beta carotene), Vitamin C, Vitamin B6, manganese, potassium and tons of fibre. The beta carotene, a natural pigment which gives the sweet potato its beautiful orange colour, is used as an antioxidant and immune booster. 1. Rinse lentils and place them in a pot with 2 cups of water. Bring to a boil, turn down the heat to a simmer and cook for 15 - 20 minutes. 2. In a large pan add 2 Tbsp of olive oil. Turn the heat to medium and add garlic and onions. Cook until onions are translucent. 3. Add sweet potato, celery, and red pepper. Stir and cook on medium heat for 5 minutes. 4. Add cooked lentils, pumpkin seeds and remaining 2 Tbsp olive oil. Combine mixture and simmer, covered, on low heat for 15 minutes. If anything starts to stick you can add a few tablespoons of water. 5. Remove from heat and add pumpkin seed oil, salt and cayenne pepper to taste. Continue to stir away from heat for a few minutes. 6. Add 1/2 cup chopped parsley to serve. Bonus Tip: The pumpkin seed oil in this dish really does make the dish in terms of flavour. You could use olive oil but you would be missing out!